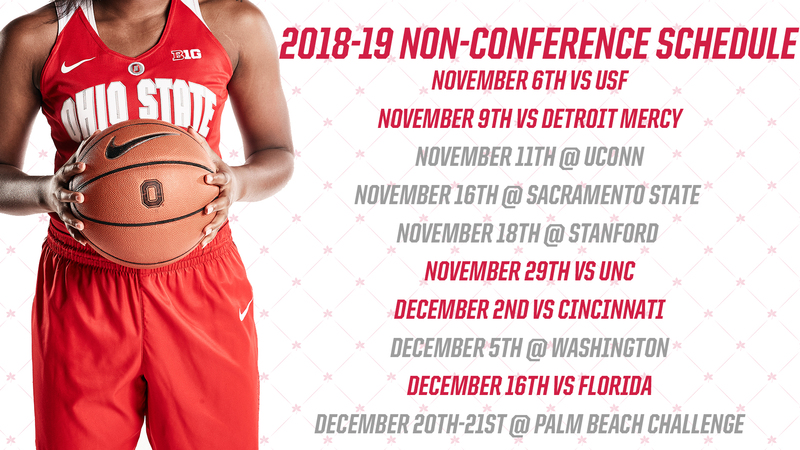 For the third time in four years, the Ohio State women's hoops team will take on perennial powerhouse Connecticut as the Buckeyes released yet another loaded non-conference schedule on Monday. Ohio State will travel to Connecticut on Nov. 11 to take on UConn, looking for revenge from the first two games which the Buckeyes lost decisively in 2015 and 2016. In addition to the Huskies, the Buckeyes will take on two other 2018 NCAA Tournament teams, traveling to Palo Alto to face Stanford and hosting South Florida in the season opener. Ohio State played both the Cardinal and the Lady Bulls last season, defeating Stanford twice – once in the Countdown to Columbus Showcase and once in the Play4Kay Showcase – and falling to South Florida. The Buckeyes will also host North Carolina, Cincinnati, Detroit Mercy, Sacramento State and will travel to Palm Beach, Florida to take on Butler and Virginia Tech in the Palm Beach Challenge. They also host one additional game in historic St. John Arena when they will take on Florida on Dec. 16. Ohio State Dept. of Athletics. Ohio State will feature a new-look roster this season after the team graduated its top-six scorers and all five starters, three of which are currently playing in the WNBA. The Buckeyes will lean heavily on returning contributors Makayla Waterman and Jensen Caretti, but brought in nine new players, including five graduate transfers, as reinforcements. The graduate transfers include Najah Queenland from Pacific and Carly Santoro from Bowling Green, Adreana Miller from LaSalle, Ashanti Abshaw from Cleveland State, and Carmen Grande from Ball State. The freshman class is the largest the team has signed since 2014. It features two international players – four-star post player Dorka Juhasz from Hungary and four-star forward Aixa Wone of Spain – as well as four-star guard Jannai Crooms and three-star forward Aaliyah Patty.